The world is full of hidden, forgotten treasures. Like this gigantic bunker excavated in a forest, buried in a secret location. It's full of weapons from the first World War, as well as modern military vehicles. And mushrooms. It was discovered by urban explorers who, as usual, will not reveal its exact location. 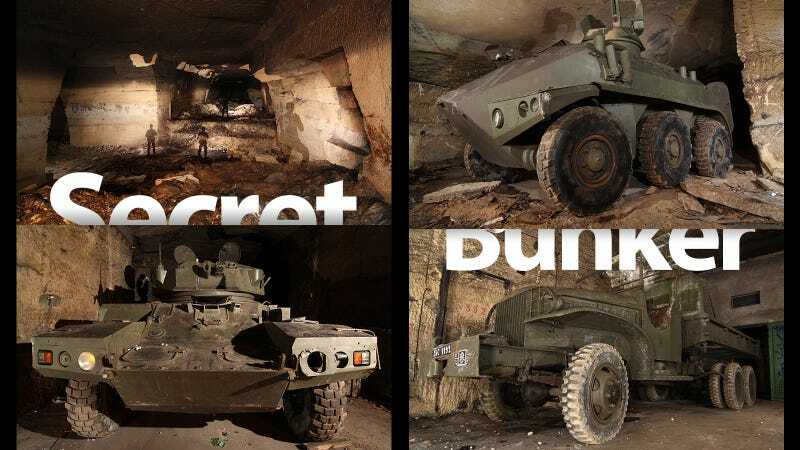 The bunker—which is located somewhere in France—was used during World War I and II. It contains all kinds of vintage weapons, from a German 77mm Model-1896 WW1 cannons to tanks, armored vehicles and military trucks that are almost intact. It's deeply underground, with gigantic caves excavated into the rock. There are plenty of barracks and office space as well. Most recently, the bunker was used by the locals for the cultivation of mushrooms. Are you an urban explorer? Have you found amazing stuff hidden in weird places? Did you take awesome photos? Write to me to jesus@gizmodo.com. We would like you to write an article about your adventures and your art.